Join TVUUC Staff and Volunteers for a week of camp fun this summer! 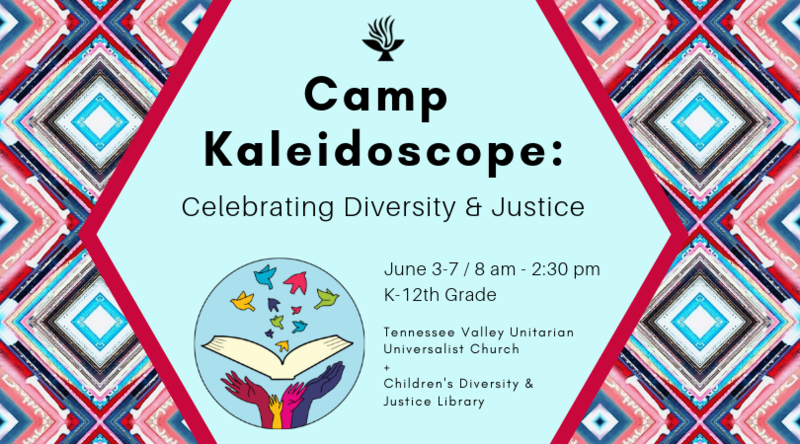 We are very excited to be partnering with TVUUC’s new Children’s Diversity & Justice Library to offer a Diversity & Justice camp week. Activities include focusing on celebrating all kinds of families, exploring the wonderful diversity of cultures & traditions in our Knoxville community, welcoming refugees & immigrants, affirming the worth and value of all bodies & abilities, a crafts tie-in with a beautiful 12-inch kaleidoscope-making project led by kaleidoscope expert Bob Grimac that we’ll work on throughout the week, and a field trip toward the end of the week to put our hands and hearts to work as justice-makers. Kids will learn instruments, music, and movement with our Director of Music Leslie Gengozian and ‘UU-Terns’ Children’s Choir director Ann Barber, as well as traditional summer camp activities such as arts & crafts, outdoor games, and water play. Read more and register in the form below. Form not working? Click here.